Pembroke Players is an amateur theatrical society based in Cambridge, England, and is considered the most active college drama society in the country. It is especially famous for staging international tours, including an annual tour to Japan since 2007. 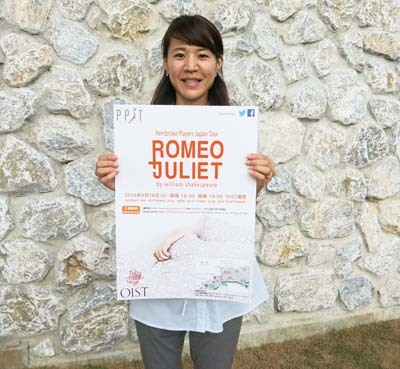 Friends of drama theater will enjoy Shakespeare’s Romeo & Juliet at OIST Auditorium on Sep. 18. The society stages more than 25 drama and comedy productions every year. The Pembroke Players has been active over 60 years and counts numerous famous stage actors among its alumni. Shakespeare’s Rome and Juliet is arguable the most famous love story in the world. The Pembroke Players’ 2016 Japan Tour is scheduled to include a show at the Okinawa Institute of Technology and Science (OIST) Auditorium on Sunday, Sep. 18 where the Pembroke Players will stage a short version of William Shakespeare’s masterpiece. The English language show starts at 19:00. Admission to the show is free, but reservations are required on line at http://www.oist.jp/reserve.